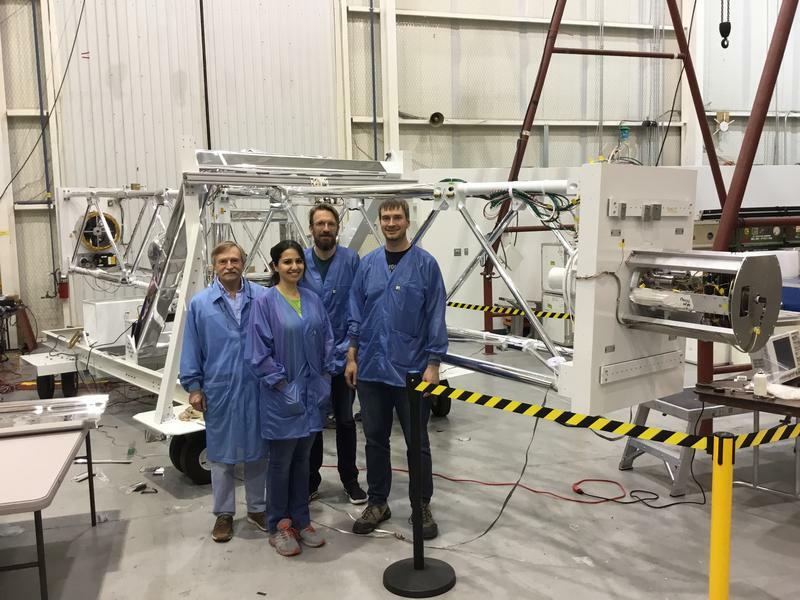 Washington University team (from left to right): electrical engineer Paul Dowkontt, graduate student Banafsheh Beheshtipour, and professors Krawczynski and Kislat) in the Fort Sumner NASA station in front of the X-Ray telescope. A giant balloon will soon provide scientists at Washington University in St. Louis a view of black holes in the Milky Way galaxy. Researchers will launch the 40 million cubic foot unmanned balloon, carrying an X-Ray telescope named X-Calibur, this month from NASA’s Columbia Scientific Balloon Facility in Fort Sumner, N.M. The payload will ascend 126,000 feet into the stratosphere, which is about four times the cruising altitude of commercial airplanes. The telescope will spend 20 to 30 hours in the air pointing in the direction of two black holes and two neutron stars, which are the collapsed cores of large stars. Such extreme objects emit X-Ray light and in order to detect them, the balloon must reach a level of the atmosphere that doesn’t absorb most of the radiation that comes to Earth. Washington University astrophysics professor Henric Krawczynski wants to gain a deeper understanding of how black holes consume matter in the universe. 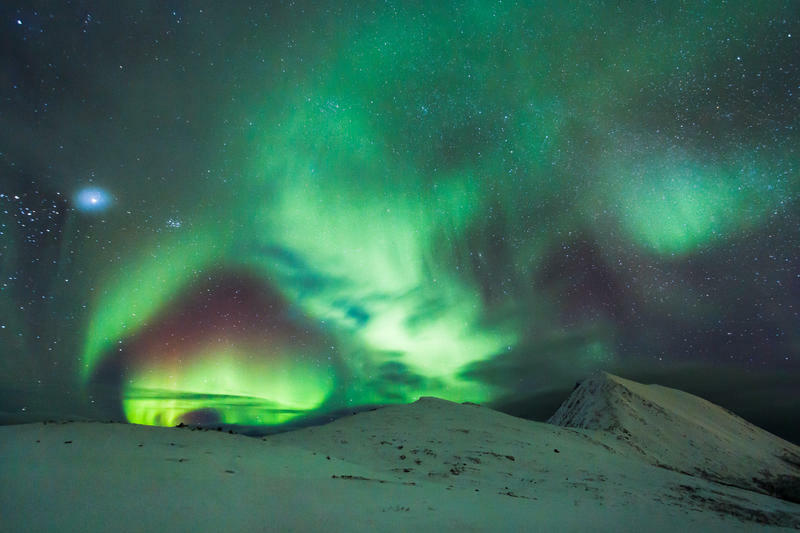 “It is an interesting topic if you want to understand how galaxies evolve,” he said. Black holes are formed by collapsed supermassive stars and exist in the center of galaxies. With the telescope, the team from Washington University hopes to study some of the activity that happens as matter enters a black hole. “Before going into the black hole, [matter] goes around the black hole, like water goes down the drain, it kind of swirls in the sink,” Krawczynski said. Researchers also attempted the mission two years ago, but a failure in the technology used to point the telescope in the direction of the black holes prevented it from going forward. “The telescope has to point at the celestial object, the black hole, with an accuracy of roughly 100th of a degree, so we have to point very precisely,” Krawczynski said. In 2014, the team relied on new technology from the Goddard Space Flight Center, in which the telescope sat on a high-pressure ball. Unfortunately, the setup could not precisely aim in the direction of the black holes the researchers wanted to observe. Krawczynski has more confidence this time in using a pointing system developed by the Wallops Flight Facility, which involves a system of motors. Maggie Duckworth is an electrical engineer and costume designer. She’s also the only St. Louis-area resident who’s still in the running for a one-way ticket to Mars. Duckworth is a finalist for the Mars One mission to build a human colony on the Red Planet. Mars One is a Dutch nonprofit organization that plans to send humans to Mars by 2024. It will award 24 one-way tickets and Duckworth has made it through three rounds of cuts.